Why Choose Carpets 2 Go? With so many carpet suppliers and fitters to choose from, what makes Carpets 2 Go the place to go for your floorcovering requirements? 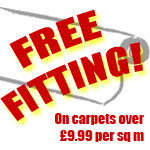 Premier Service - Carpets2Go are proud to offer our customers a 5 star fitting service. From our Free Estimating & measuring service, genuine advice on colour & quality, removing & disposing of old floorings & moving of furniture, to our unrivalled After Sales service. Experience - Mark and Vance have had over 30 years experience in the carpet industry. Their expertise and knowledge will ensure that you get the carpet you want, and the value you expect. Local - being a local store, Carpets 2 Go work that much harder in providing only the best service to their customers. Easily accessible from the Hilsea roundabout, by car or bus, everyone is welcome to view the extensive range of carpets in their brand new store in London Road. Mobile Showroom - if you can't make it into our showroom, don't worry - we'll come to you! We can bring our range of carpets straight to your home and give you an estimate there and then.